Deep foundations are becoming more common, as land prices encourage taller buildings and developers build on poorer soils. Every building needs a solid foundation. Depending on the size of the building and the soils at the site, some of those foundations extend more than 30 feet below ground level. That can present serious challenges to the designers and builders, who must ensure the basement levels stay dry, despite the enormous water demands soil and water pressure place on the waterproofing. There are many reasons geotechnical engineers specify deep foundations, but the most common are either poor surface soils or large design loads. 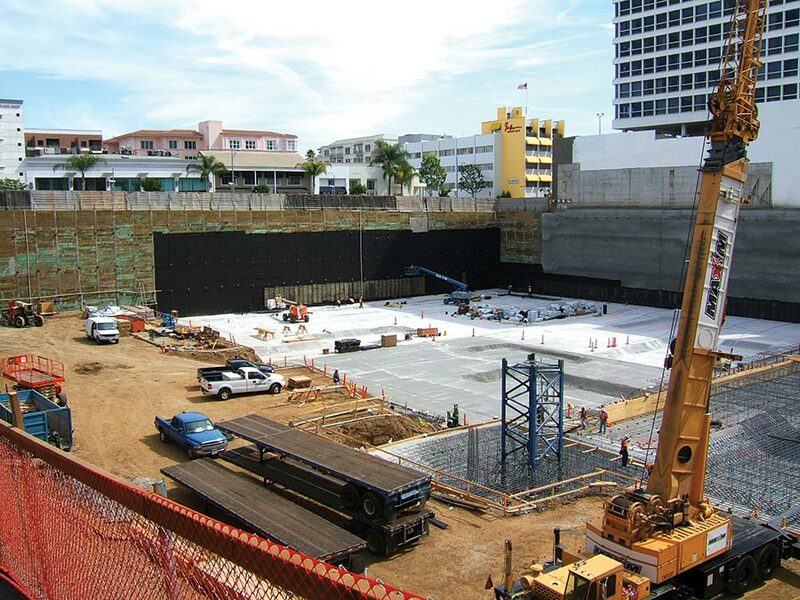 Pile and pier foundations that are driven or drilled into the soil don’t require much waterproofing. The most difficult projects are the excavated deep foundations that involve living spaces well below the water table. The “Bathtub” at the World Trade Center is one of the best known deep foundations in the world. The most famous deep foundation is probably the “bathtub” that surrounds the site of the former World Trade Center. Seen by millions during cleanup efforts after the twin towers collapsed, it remains a classic example of this type of structure. 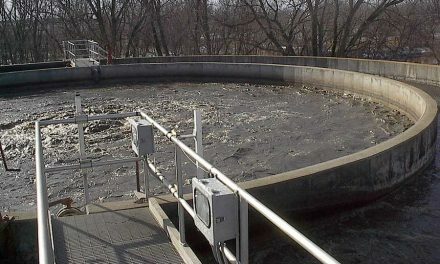 It was built using slurry wall techniques, and used bentonite and a special concrete mix design for waterproofing. In order to support the incredible weight of the twin towers, builders needed to set the buildings on solid bedrock, which in lower Manhattan is between 60 and 80 feet below the surface. As an additional challenge, the site was actually in the historic river channel; the soil was completley saturated only a few feet down. 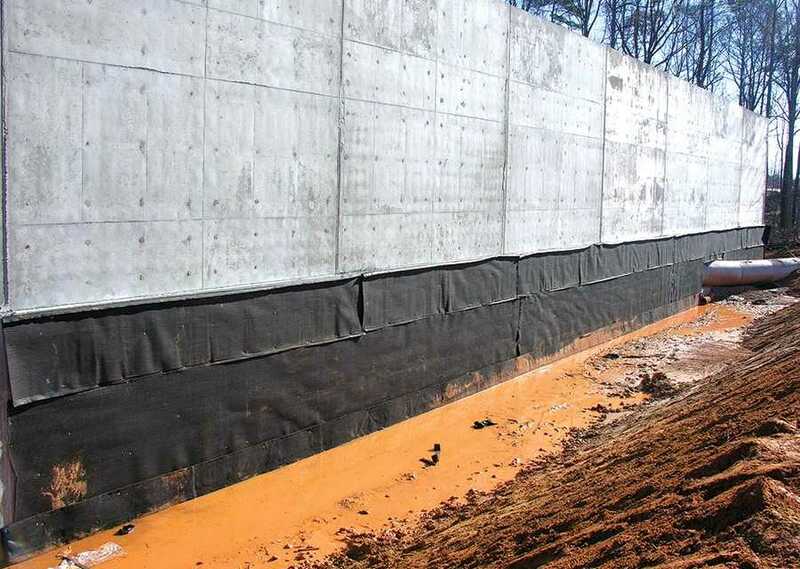 To solve these challenges, designers chose to use a slurry wall—used previously in subway construction, but never on a project of this scale. Crews used excavating machinery to dig a series of 3-foot-wide trenches down to bedrock level. As they dug, they piped in a slurry made of water and bentonite clay to seal out groundwater. Known as 55 Allen Plaza, this building in Atlanta used crystalline waterproofing to ensure it’s four-story below-grade parking garage stays dry. Once a 22-foot section of trench was finished, they lowered steel reinforcing—seven stories tall—into the slurry, and started pumping in concrete. The heavy concrete sunk to the bottom of the trench, and the lighter slurry was pumped off the top. It took 152 of these 3’x 22’ sections to ring the eight city blocks to be excavated. As the dirt inside the “bathtub” was removed, crews installed tiebacks to resist the pressure of the dirt outside the walls. The three-foot thick, steel-reinforced concrete walls kept the river at bay and allowed the rest of the building to be constructed. The tiebacks were removed once the seven underground stories were completed and provided lateral support to the walls. With the collapse of the towers, the tiebacks were reinstalled to secure the walls, which had already shifted inward nearly a foot. Deep foundation projects of a lesser scale are being built in every major city in America right now. In Washington D.C., workers have just finished the massive below-grade portion of the new Chinese Embassy. With nearly half a million sq. ft. of floor space, it will be the largest embassy in the Capitol. Surprisingly, five levels of the nine story building will be built below ground. The jobsite has a considerable slope, with excavations reaching 98 feet below grade on the uphill end of the site; 42 feet below grade on the lower end . Groundwater in the area is about 17 ft. below the surface. Unlike the WTC foundations, the basement levels were excavated and tied back with conventional methods. More than 1,500 soil nails and 50,000 sq. ft. of shotcrete keep the tiered excavation from collapsing. At the bottom of the massive pit, builders began working upwards with the walls. They were waterproofed using regular positive-side methods; the 8-inch thich shotcrete walls are designed to keep most of the water out. 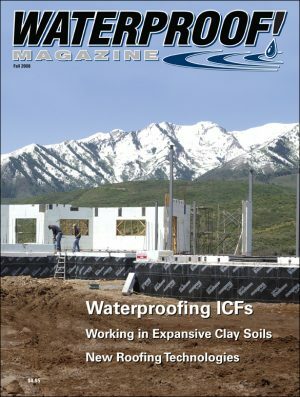 Because the skyscrapers that require deep foundations are typically built on congested downtown sites, many deep foundations use “blindside” waterproofing techniques. 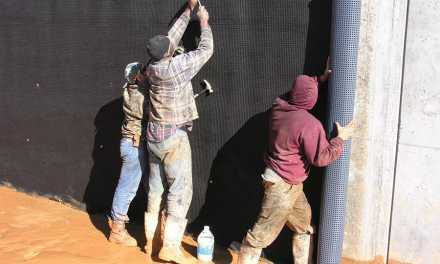 Blindside techniques are also common on tunnels and retaining walls, where excavation for positive side waterproofing is not feasible. Blindside applications are common with deep foundations. 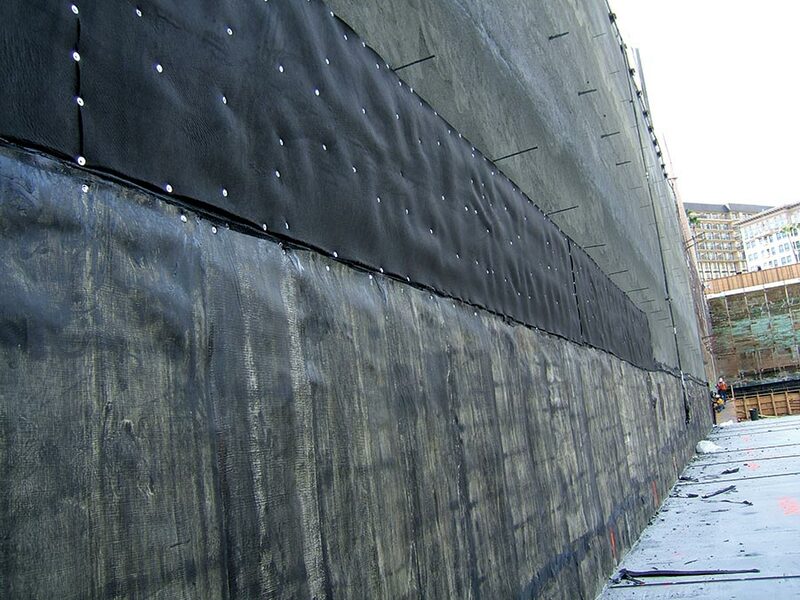 Here, a dimple membrane has been applied over the lagging walls. The structural foundation will be poured against the exposed side of the membrane. All of the techniques mentioned so far involve applying a coating or membrane to the below- grade concrete surface. 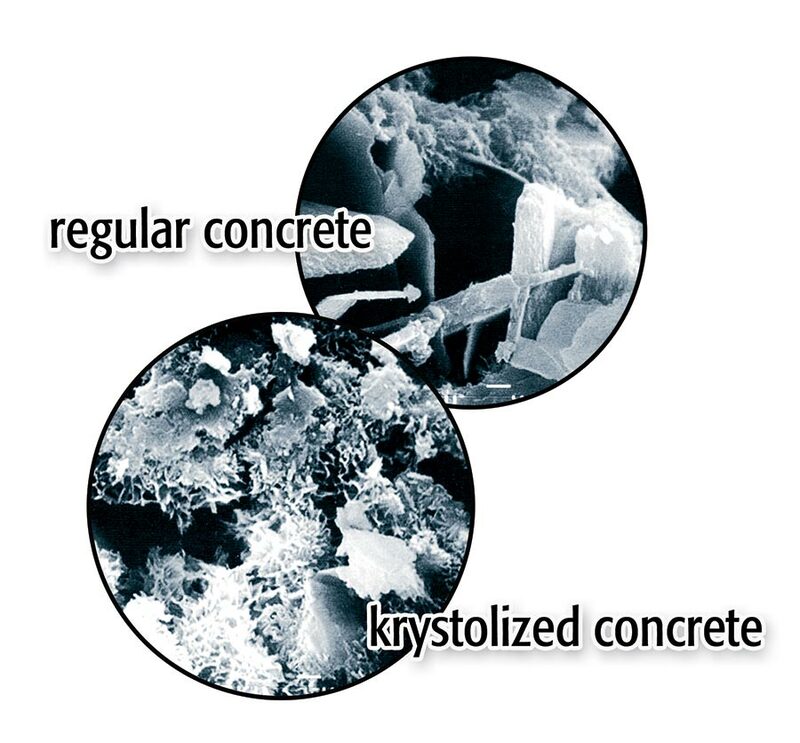 Integral crystalline waterproofing (ICW), on the other hand, is a concrete admixture that makes the concrete matrix itself waterproof. 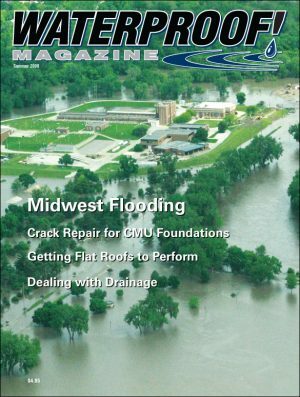 Some brands of ICW can seal cracks that occur even after the concrete has cured. Allen Plaza in downtown Atlanta used integral crystalline waterproofing to ensure the four-level below-grade parking garage stayed dry. The project team selected ICW system because it offered a number of key advantages. 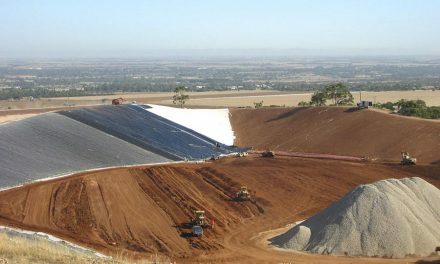 It eliminated the time required to apply a membrane system, would not deteriorate in dry, hot weather, and could be applied in damp/wet conditions. 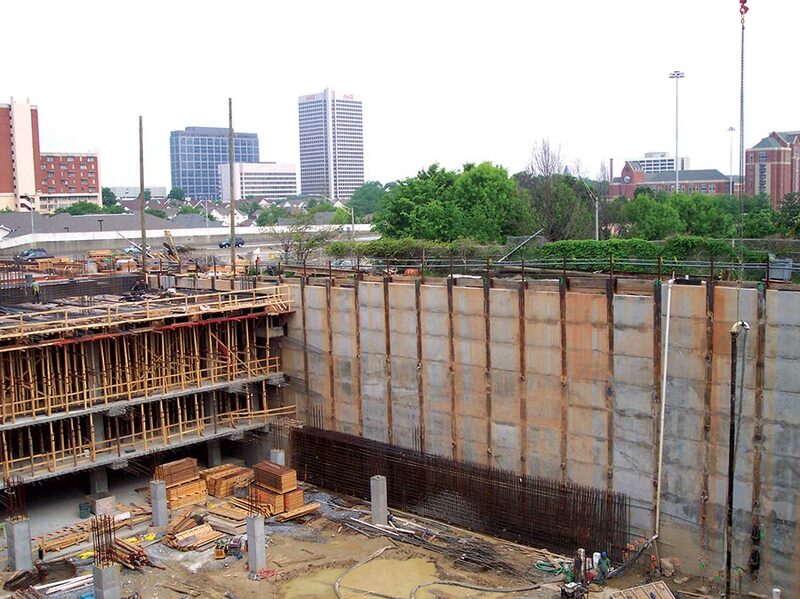 The 14-story office complex nearly filled the available site, so the 40 ft. basement walls were poured blindside. 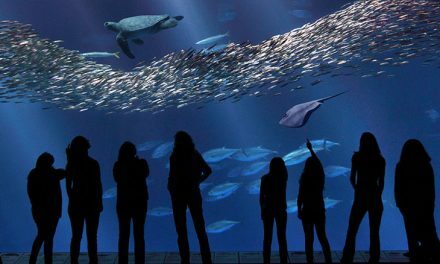 The mixture—composed of Portland cement, silica sand and proprietary chemicals—were added to the concrete just before the pour. The project used 16,000 lbs. of Kryton’s Krystol Internal Membrane. An additional 3,500 lbs. 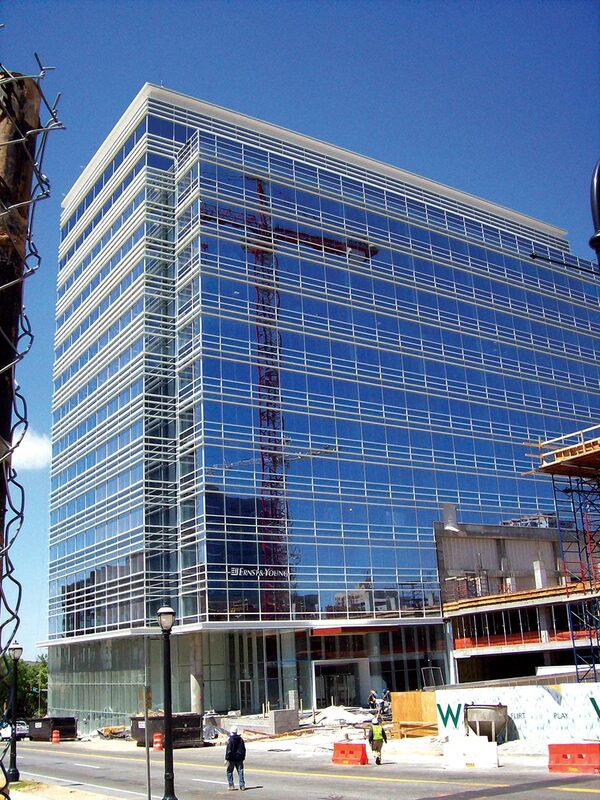 of their Krystol Waterstop System was used to ensure cold joints between panels were properly sealed. Deep foundations are becoming more common, as land prices encourage taller buildings and developers build on poorer soils. 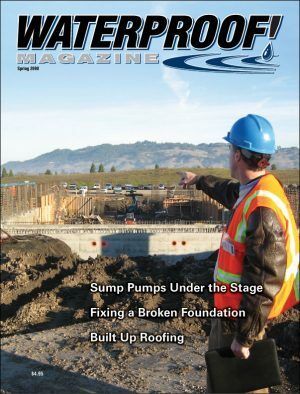 The waterproofing industry continues to invent better products and techniques to deal with these challenges, and dozens of major projects are completed across the country every year. 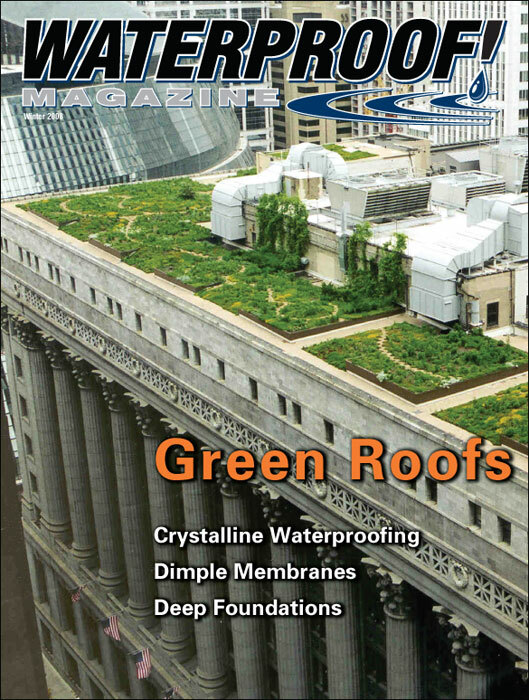 Investing the time to research, compare and select the best waterproofing system today will save a lot of time and expense in years to come.